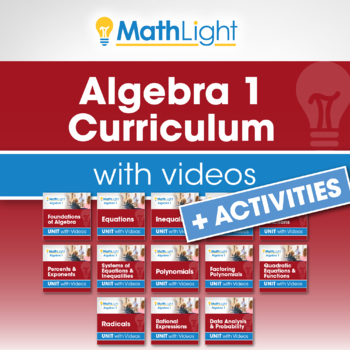 Save money with the complete Algebra 1 curriculum! Grab it now to get it at the lowest price - and receive each new unit as it's released. NOTE: We plan to release all new units in time for use during the 2018-19 school year, so grab the bundle now for the best price - and get each unit as it's released. 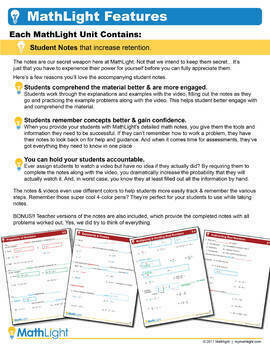 Each concept is taught via a video lesson. 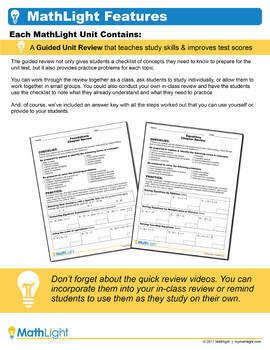 You also receive accompanying student notes, differentiated practice exercises, guided unit review, editable assessments, and more. 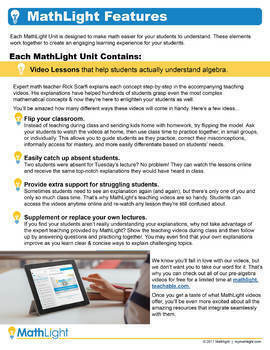 Check out the preview for more details about the awesome features in this Algebra 1 curriculum. As veteran math teachers, we’ve learned firsthand how to explain complex topics in a way that makes sense to students. We absolutely love those light bulb moments and are committed to bringing more of them to your students as well. Hence our name - MathLight! We’re here to provide you with awesome resources to enhance your math classroom. But what makes our program uniquely amazing is that it’s fully integrated with video lessons. Combine our awesome video lessons with the complete system of guided notes, differentiated practice, and editable assessments, and you have all you need to create a dynamic, engaging, and successful classroom culture. You can finally focus on teaching because we’ve done all the prep work for you.